Today, we cultivate 7 parcels of vineyards, for a total of 2.4ha, in the Grand Cru Brand. It would be easy to put all of them into one single wine, but this is not the solution we opted for. The Brand is a complex vineyard, with subtle soil variations (composition of the granite) and different interaction potential with the vines according to their age. Obviously, our Brand ‘Vieilles Vignes’ comes from our oldest vines on the Brand (we are not actually sure of their age, probably before WW2, but in doubt, we say they are from 1950) and also from the area in Brand which has some marl limestone deep under the granite (Schneckeslbourg). This soil characteristic allows these vines to be more draught resistant, capable to reach very high ripeness levels and also develop some noble rot, even in very dry vintages like 2007. This vineyard is our oldest and nicest massal Riesling selection on the estate, so we also use it as a source of high quality buds for our new plantations. 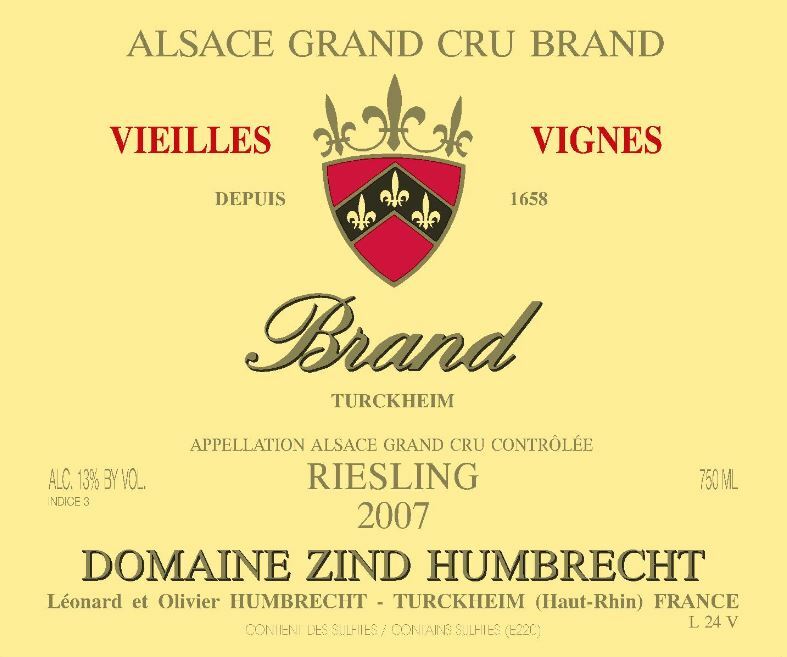 In 2007, the grapes were harvested at a higher ripeness than any other Riesling, which also explain the higher sweetness of this wine. 12/2008: the nose already appears very open, showing lots of ripe white fruits (pears, peach, and apples) and delicate honey sweetness. I know that it is impossible to detect tactile sensation on the nose, but if one wine would give the sensation of velvet, it would be this one. The palate feels unctuous, round, velvety, with more honeyed character and light wet stone minerality. The finish is surprisingly much drier than expected, thanks to a beautiful acidity. This is by far our richest Riesling in 2007, but also the most elegant.